So here’s the last (as far as I know) of the Shin Ramyun line from Nongshim. 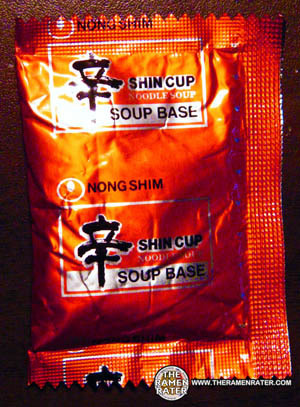 Shin Ramyun (pack), Shin Cup, Shin Bowl and Shin Big Bowl. Let’s give it a go. 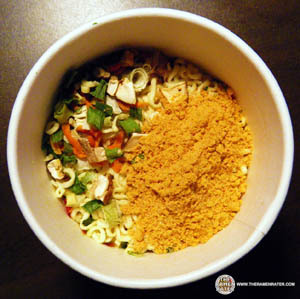 One packet – full of the powder seasoning. Some veg and the powder awaiting the boil and a few minutes to steep. Click image to enlarge. Finished product. Well, the noodles are pretty stock as it were. A little spongy and a little thicker so they’re just so-so. The veggies all his at the bottom after a good stir; I really dislike that but what can you do? The broth is hot, there’s no question about that! My lips are burning – nice burn. Not too shabby. 3.0 out of 5.0 stars. Get it here. 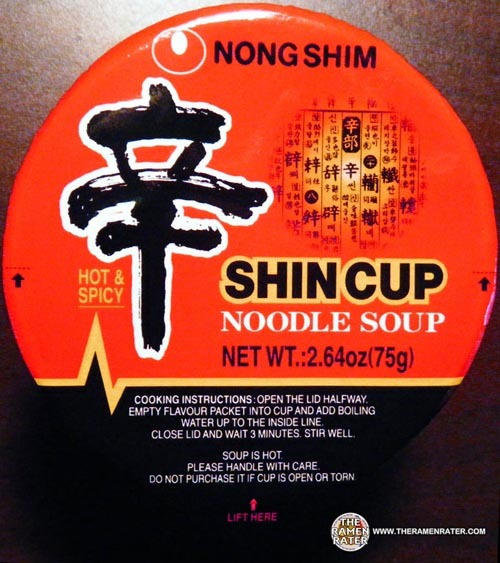 This entry was posted in * Stars 3.1 - 4.0, Nongshim, Other, South Korea and tagged burning, hans lienesch, hot, hot hot, hot taste, korea, korean, liebesch, lienesch, nong, nong shim, noodle soup, pepper, Ramen, ramen rater, ramen review, ramen reviewer, ramen reviewers, ramen reviews, ramenrater, ramenrater.com, ramenreview, ramyun, rater, rating, ratings, review, reviews, shim, shin, shin cup, shin ramyun, spicy, spicy taste, taste, the, the ramen rater, veggies on June 14, 2011 by Hans "The Ramen Rater" Lienesch. This is one of my favorite convenience foods. It is just the right size for a small snack on a cold day. The other sizes (bowl, big bowl) are sometimes too big, but this one is easy to throw in your bag and go. Yeah the Shin Cups look pretty portable! If you ever get a chance to try the original Shin Ramyun from Korea, you’ll see that the stuff Nong Shim makes in California is inferior. I wish we could get the original in the states but I haven’t seen it in years. I’d love to try it – although Korea’s quite a ways away from the Seattle area and so hopefully there will be someone who wants to donate one from over there. 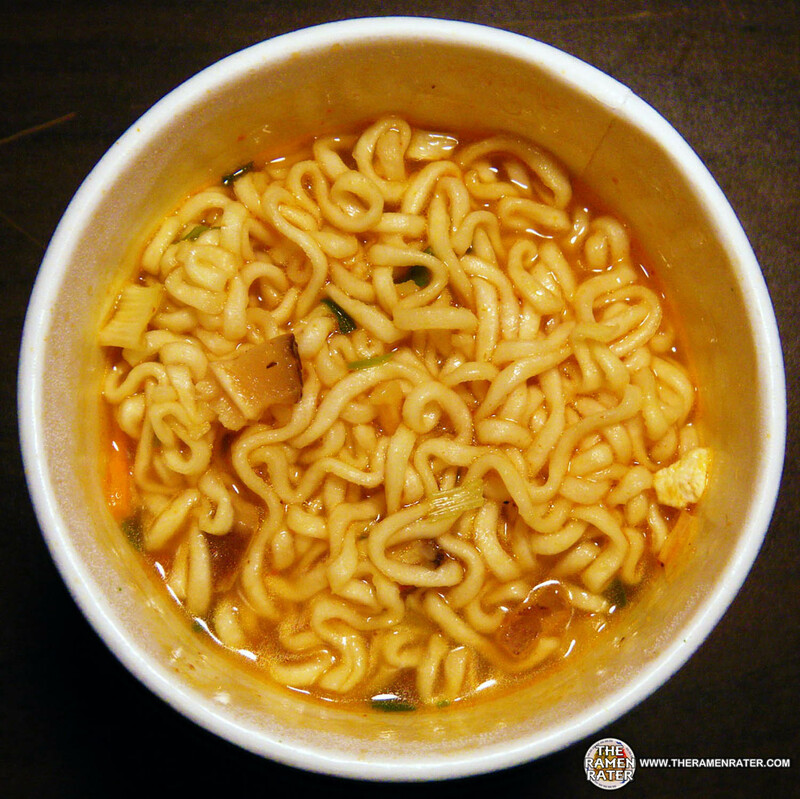 I want to try their Kimchee, Mushroom and Black Shin Ramyun as well! I don’t know for sure but you may still be able to get the “made in Korea” version in Canada. I thought the Kimchee version was okay however I only bought it once if that tells you anything. If the black version is from Korea, I’ll definitely buy it if I see it. I’ve never had the mushroom flavor.